When you can’t decide which neutral colour to wear, wear them all together! I think that a brown or beige or camel, or whatever you’d like to call the colour of my hat and skirt, is a nice way to soften an otherwise monochrome outfit. My skirt here is actually a dress, which I bought a number of years ago at one of those small-town-cheapy-shops when skater dresses were all the rage. I quite like the effect it gives here though! 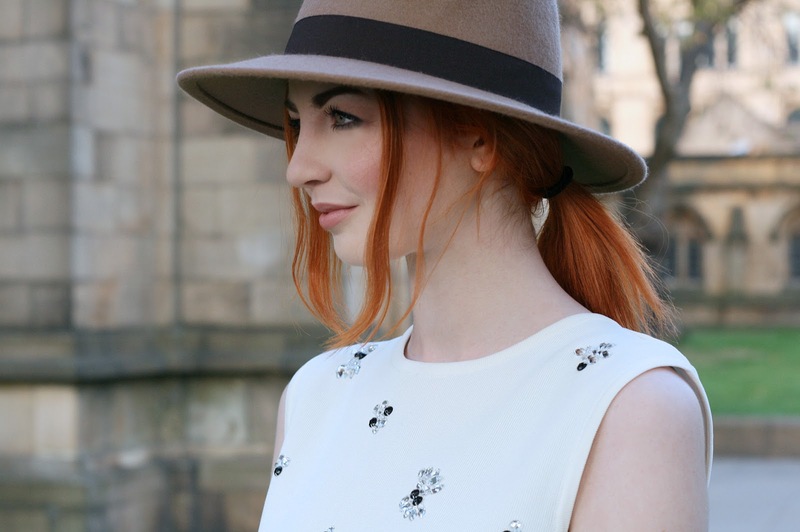 My camel fedora is from Primark and is only £7 but definitely one of the nicest fitting hats of a similar kind that I’ve tried – I will definitely have my eye out for other colours now. I’m also a fan of this subtly embellished ribbed vest, from Tesco’s clothing range F&F – you can check out my look and lots more F&F outfits on their ‘How You’re Wearing It‘ page. Now, the main event of this outfit has to be these incredible boots. White is a change from the usual little black boot for me, and as much as I was drawn to the black version of the Jessie I’m glad I went for these. They have a heel which is a tiny bit higher than I usually like for the daytime but are actually very comfy, and I just love the western buckles and detailing! Shop the Jessie and other fab new Missguided shoes at their Shoesuem. Gorgeous look ! I'm so loving the hat and the boots ! Love this outfit, the top looks great with the tan skirt. Normally I wouldn't look twice at those boots but the buckles are gorgeous! Uncategorized Giveaway: Win a Chi-Chi dress!